Manually operated two-way ball valves provide quick ¼ turn onoff control of fluids in process systems. 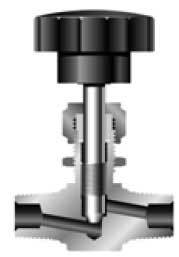 Valve body and seat material options provide a broad range of temperature and pressures at which the valve may be used. 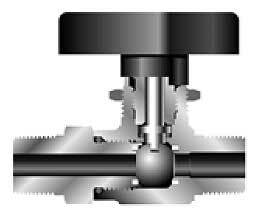 of temperatures and pressures at which the valve may be used. 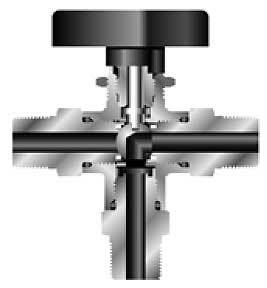 Check Valves are designed for uni-directional flow control of fluids in process systems. Needle Valves are designed for positive shut-off and regulation control of media in process systems. A variety of end connections, temperature ranges, and pressures provide the user the utmost in control and flexibility. Safety Couplings are designed to provide a quick and convenient way to connect and disconnect fluid lines. STC Series couplings are keyed and color coded for safety and positive identification of fluid or pressure lines. users to prevent accidental connection of non-compatible media and pressure lines in multi line systems and provides a mechanical lockout in a variety of colors, each numbered and keyed exclusively to prevent interchangeability in critical applications. • The push-to-connect design means no tools are required. • Both DESO (double end shut-off) and SESO (single end shut off) Stem designs. • DESO design features a poppet valve in both stem and body, SESO design in body only.